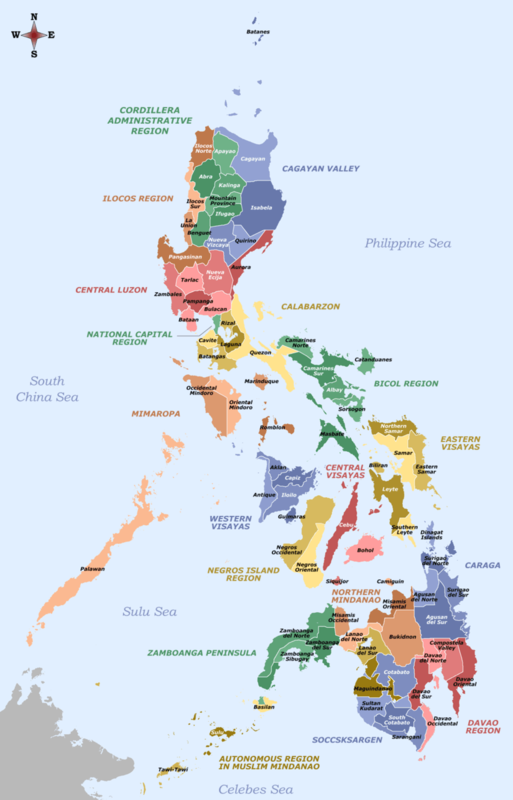 Central Luzon (Kapampangan: Kalibudtarang Luzon; Pangasinan: Pegley na Luzon; Ilocano: Tengnga a Luzon; Tagalog: Gitnang Luzon), designated as Region III, is an administrative region in the Philippines, primarily serving to organize the 7 provinces of the vast central plains of the island of Luzon (the largest island), for administrative convenience. The region contains the largest plain in the country and produces most of the country's rice supply, earning itself the nickname "Rice Granary of the Philippines". 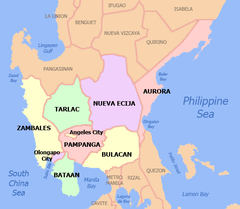 Its provinces are: Aurora, Bataan, Bulacan, Nueva Ecija, Pampanga, Tarlac and Zambales. 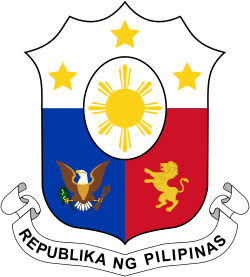 Central Luzon Region is located north of Manila, the nation's capital. Bordering it are the regions of Ilocos and Cagayan Valley to the north; National Capital Region, CALABARZON and the waters of Manila Bay to the south; South China Sea to the west; and the Philippine Sea to the east. Aurora was transferred from Region IV through Executive Order No. 103 on May 2002. Eighty percent of the population of Central Luzon is Roman Catholic. Other religions represented are Protestants (including Evangelicals), Islam, and Iglesia Ni Cristo. The Members Church of God International (also known by many as Ang Dating Daan) headquarters is located in Apalit, Pampanga where most members are. There are also other denominations such as Jesus Is Lord, Pentecostal Missionary Church of Christ, Jesus Miracle Crusade, United Methodist Church and others. 1 2 Edenhofer, Ottmar; Wallacher, Johannes; Lotze-Campen, Hermann; Reder, Michael; Knopf, Brigitte; Müller, Johannes (2012-06-25). Climate Change, Justice and Sustainability: Linking Climate and Development Policy. Springer Science & Business Media. p. 206. ISBN 9789400745407. ↑ "DILG Region 3 - Regional Management". Department of the Interior and Local Government. Retrieved May 29, 2016. 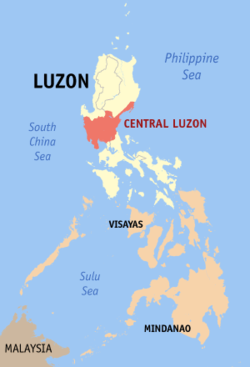 ↑ "Central Luzon, Region III, Philippines". flagspot.net. ↑ "Region III, Central Luzon, Geographical Location". evis.net.ph. ↑ "REGION III (Central Luzon)". National Statistical Coordination Board. ↑ "Executive Order No. 103; Dividing Region IV into Region IV-A and Region IV-B, Transferring the Province of Aurora to Region III and for Other Purposes". Philippine Statistics Authority. 17 May 2002. Retrieved 29 March 2016. SECTION 4. The Province of Aurora is hereby transferred to and shall form part of Region III.